Pacer Mike promoting the A Christmas Story Run! 3:21.01 in 2008, two seconds away from my then Boston qualifying time, for more crazy stories join my pace group. Well overall I’ll still go with Towpath, but favorite start- Mohawk Hudson, Favorite finish- Wineglass, Favorite challenging but scenic course and best volunteers, Blue Ridge, and honorable mention to Run For the Red in the Poconos. Well besides running and training I like to sit outside while listening to good music, reading, and drinking Japanese green tea. My famous cereal before the race. Whatever is in my hydration pack during the race, and then shamefully whatever junk food I happen to come across on the way home from the race. Any technical running book I can get my hands on, also fantasy or science fiction. Harry Potter Trivia anyone? Mostly people from my Facebook group, Mike’s Challenge. Once and for all break 3:20 for the marathon. I have paced 20 something marathons now, but I’m always looking to improve and learn as a pacer. It’s getting to the point where I just don’t know any other way. 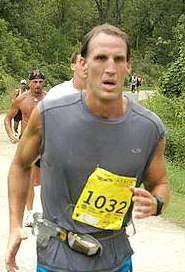 After a disappointing finish, I decided to run the Towpath marathon 15 days later which at the time I thought was crazy. Well I decided to smile more and have more fun, and I dropped 8 minutes from my previous marathon. Would have been more except I made a wrong turn at mile 26. Remember those crazy stories I was telling you about? 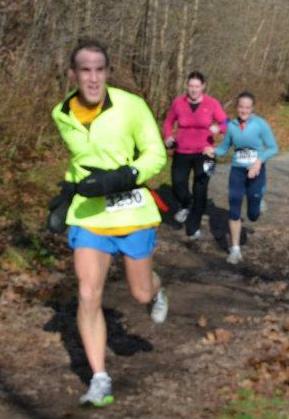 : Well first, let’s face it, I’m a ham as you might notice particularly at the starting line. But really, I am very big on helping people accomplish their goals, just watch how fired up I get at the finish when you tell me you accomplished yours. And of course I love the race atmosphere. Before I officially started pacing, there was a girl who I informally paced on runs, who was running her first 30k. I appeared at different spots rooting her on, listened as her parents shouted at her with pride, and then, for the last mile, wearing jeans and a long coat, ran her in, just like I had for so many training runs. Very emotional. Use the group anyway you want. Some people just want to keep me in their view and pass me later. Others may want to be motivated and be chatty. If so, I am not good with names so please take one of our bibs at the expo and write your name on it. Don’t be afraid. Listen to my strategy at the starting line, I am usually pretty loud. During the race, stay positive and be grateful, not only will you have more fun, you’ll run faster, trust me! Don’t be afraid to start slowly, and instead be a party crasher with me, a party crasher is someone who crashes a person’s party at the end of the race by zipping right past them! Or stay right with me for the final “HOOOHHHHH!!!!!!!!!! !” going into the finish. 1. Are you reasonably confident that you can hold this pace? 2. Have you done one or more runs of at least 18 miles on a similar course where your pace was within 75 seconds per mile of the goal pace? Did you finish strong? 3. Is your pace for an average relatively easy run within at least 45 seconds to a minute per mile from the goal pace? 4. Do you do interval runs where the intervals are at least 800 meters, and is your pace at least 30 seconds per mile faster than the goal pace? 5. Are you basically injury free? If the answers to any of these questions are no, seriously consider moving to a slower group at the start. I love having a big group at the start, but I love even more having a big group of the same people at the finish. For those of you at Wineglass, the first person who can tell me that whenever I played 20 questions during a race last year, I always picked President William Howard Taft, if I have it with me or you see me afterwards, I’ll give you my Wineglass champagne spit. I don’t drink. For years I have led Jewish Sabbath Services on Friday evenings. Also I have individually coached many people for their goal races, always for free. If you want to learn more, join Mike’s Challenge on Facebook.